The March 15 crop insurance deadline is just around the corner. To aid with your contract selection, consider projected prices and how they are set. The USDA Risk Management Agency (RMA) uses futures markets to determine crop insurance projected prices. Average new crop futures prices (December for corn, November for soybeans) during February determine corn and soybean projected prices. Projected prices for 2014 are $4.62/bushel for corn and $11.36/bushel for soybeans (subject to final RMA approval). Compared to last year, prices are down $1.03/bushel for corn and $1.51/bushel for soybeans (Figure 1). The impacts of lower projected prices are twofold. First, crop insurance revenue guarantees will decrease. Second, producer-paid premiums will decrease. Current new-crop December corn and November soybean futures prices are higher than RMA projected prices, which are the average prices for the entire month of February. This implies a slightly stronger chance of harvest prices being higher than projected prices. Producers should strongly consider the use of a revenue protection (RP) policy to capture benefits (i.e., implied call option) associated with the harvest price being greater than projected prices. After the 2012 drought producers realized the benefits of RP policies in 2013 when 91% of insured corn acres and 91% of insured soybean acres were covered under an RP policy. A year ago, many producers shifted to higher guarantee levels with their policies. For the first time in Nebraska, more acres were insured at the 75% guarantee level than at the 70% level for corn, soybeans, and wheat. In fact, in 2013 more Nebraska soybeans acres were insured at the 80% guarantee than at the 70% level. One reason for this shift to higher coverage may have been to offset lower APH average yields produced by the 2012 drought. Another reason may have been the relatively attractive revenue guarantee levels resulting from higher prices. For 2014, producers interested in higher guarantee levels will get some help from the lower projected crop prices, which will make insurance premiums proportionately lower. Revenue coverage provides an implicit price floor for a given level of yield. Holding yields constant at Actual Production History (APH) levels, we can calculate the crop insurance price floor (i.e., implied put price) using this year's projected prices. We show this for both corn and soybeans in Figure 2. For example, for corn using an 85% coverage level the crop insurance price floor is $3.93 ($4.62/bushel x 0.85 coverage level). This means that if a producer's actual yield equals the APH, then an indemnity would be paid if the harvest price (determined in October) falls below $3.93. 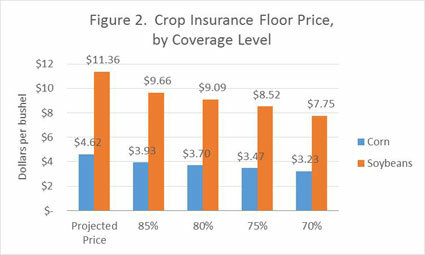 As coverage levels decline, the crop insurance floor price also declines. For corn, each 5% decline in coverage level reduces the crop insurance price floor by $0.23/bushel. For soybeans, each 5% decline in coverage level reduces the crop insurance price floor by $0.57/bushel. Consequently, higher coverage levels increase the probability of payments. Producers must balance this higher probability of payments with the corresponding costlier premium. In addition to calculating projected prices, RMA also determines the price volatility. Price volatility is important because a lower volatility implies lower premiums. 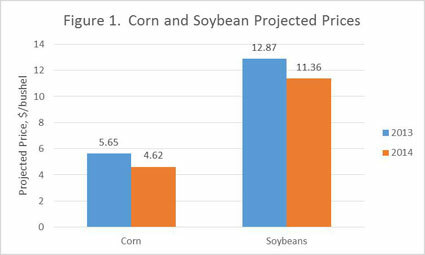 For 2014, price volatility for corn is 0.19 and for soybeans is 0.13 (Figure 3). Compared to last year, corn price volatility is down 0.01 for corn and 0.04 for soybeans. 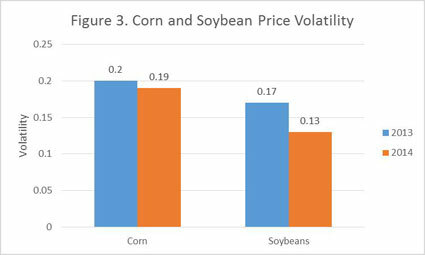 Consequently, we expect a larger premium reduction in soybeans than corn based upon the volatility factors. While lower volatility reduces premiums, it also implies a relatively tighter price range between now and harvest. Using this criterion, we would then expect corn and soybeans to stay in a relatively tighter trading range than experienced last year. For related information, see the Economics and Marketing section of CropWatch with information on Production Economics, Markets, Decision Aids, and Policy.